Update, October 23: Dragon Ball FighterZ will release on January 26, and will offer three separate editions. Bandai Namco have announced the release date for Dragon Ball FighterZ. As well as revealing that the game will launch on January 26, 2018, an announcement from the company discusses the game’s story and multiplayer modes. For more future hits, check out our list of upcoming PC games. The announcement is pretty full of of information about the upcoming release. Firstly, it confirms that the game’s story mode will be split into three different sections, allowing players to experience the story from three different perspectives, with a tactical map that impacts the way fights play out. The announcement also offers more details about the game’s online modes. Those will include the Circle Match mode, where up to eight players can enter a room at once. The announcement also revealed that the game will release in three different editions. As well as the Standard edition, there’ll be a FighterZ edition, which adds eight new characters to the overall roster, and the Ultimate Edition, which offers the new characters as well as a new voice and music pack, containing 11 songs from the anime. All three editions are available for preorder via Steam, starting today. Update June 11, 2017:Dragon Ball FighterZ has been officially confirmed at Microsoft’s E3 2017 conference. You can see the new trailer above, which shows the 3v3 combat and over the top colours. An early 2018 release date was also given. Original story June 10, 2017:Bandai Namco are working with Arc Systems to create a new fighting game set in the Dragon Ball Z universe. Expect impossible, sometimes yellow hairdos, green dudes, and punches that can smash your opponent through a mountain. Dragon Ball FighterZ will have players selecting teams of three from the anime’s huge roster, then they fight it out in “ultra high-speed battles,” probably both on land and suspended in the air, like so many manga hairstyles. This one will be ditching the 3D arenas of old games in the Dragon Ball Z series, instead opting for 2.5D, because it lets the developers do some things that they couldn’t in 3D. Battles will take place on a 2D plane, but the camera will shift and tilt dynamically to capture each fight’s drama. 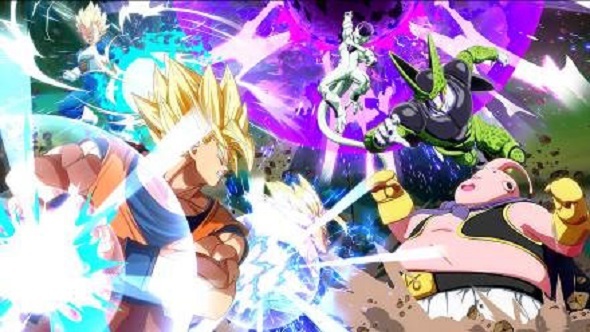 We’ve already seen glimpses of some of the roster, but you can bet fan favourites like Goku, Piccolo, Freeza, Vegeta, and Cell will all be playable. Dragon Ball FighterZ is planned to release worldwide in early 2018.